A recent photo of Dr. Yoshi Maezumi. Yoshi moved to Idyllwild with her family from Los Angeles when she was 3. Her father Roshi Maezumi was a Zen Master and founder and Abbott of the Zen Mountain Center in Mountain Center and her mother Martha is an artist and anthropologist. Yoshi is the youngest of three. Yoshi is an Idyllwild School “Hillbilly” and Hemet High School graduate from the class of 2001. From high school, she moved to San Diego with her lifelong friend Cara Klingaman (now Wilkerson). She started at Palomar Community College studying dance, then transferred to University of California at San Diego, where she earned a double major in anthropological archaeology and religious studies. From there she went to Cal State University of Long Beach for a master’s in analytical archaeology. Next she was off to Salt Lake City to complete her Ph.D. in physical geography from the University of Utah. What are some other jobs you’ve held? What is your current occupation? I have been a ranch hand, waitress, barista, bartender, personal trainer, and did contract archaeology in California during the summers. I worked as a lab tech at Scripps Institute of Oceanography during undergrad and ran two research labs at CSU Long Beach and the Natural History Museum in Utah while in grad school. During my master’s, I got my EYRT-500 Advanced Yoga Teacher Training and ran my own yoga company before I moved to England. 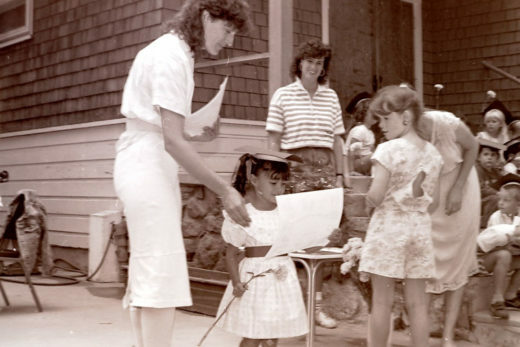 Yoshi made the front page of the June 23, 1988 Town Crier during her pre-kindergarten graduation ceremony from the Idyllwild Child Development Center. ICDC Director Cathie Davis, left, handed out the diplomas while teacher Holly Plummer watched. Later, I also taught undergrad and graduate level courses at the University of Utah. I am now living in England doing a post-doc at the University of Exeter studying how native peoples impacted the Amazon ecosystem before the arrival of Europeans. How did you get into your current field? Please describe the work you do. I did my first archaeological dig for an anthropology elective in high school. As part of a term assignment, I went to Calico Early Man Site to volunteer to excavate for a weekend. I was hooked. I grew up dancing, but after a bad car accident when I was 17, my back couldn’t take dancing full-time any more. I got into academics after community college. Remembering how much I liked archaeology, I decided to do that for my major and loved it. While at UCSD, I got more and more into field work and excavations abroad. I went on digs in Jordan, Mallorca [Spain], Rome, and Guatemala. During my master’s, I became increasingly interested in how past peoples impacted their environment, which led me to a field of science called Paleoecology (the study of past ecosystems). My Ph.D. focused on the Paleoecology of the Bolivian Amazon. 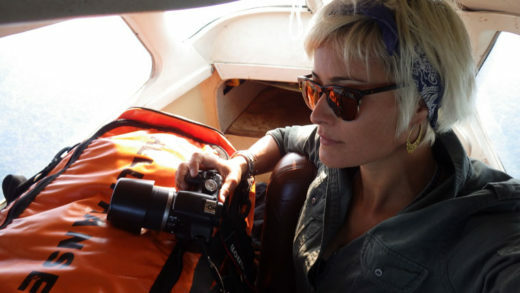 I am continuing my current research in the Bolivian and Brazilian Amazon. To study past ecosystems, I analyze fossilized plant remains (like pollen and charcoal) from lake sediments. Lake sediment cores are natural data loggers that preserve charcoal and fossilized plant remains over thousands of years. I spend a few months a year in the Amazon collecting sediments, then the rest of the year in the lab or at a microscope analyzing the fossil remains throughout the core. What was special for you about growing up in Idyllwild? Growing up in wilderness, with lots of wide-open space. It was safe to play and roam in the forest, which fostered a sense of independence and love of the outdoors at an early age. I also love small towns and being able to know your neighbors and having life-long friends. Who were your Idyllwild mentors (teachers, coaches, friends’s parents, etc.)? I remember all of my teachers very well. I remember the first time I got a referral for running in the hallway from Mrs. Martha, my kindergarten teacher. Mrs. Schmidt transformed her class room into a two-story castle complete with a Rapunzel wig. I did my first science fair project in Mrs. Poirier’s class. Mr. Holmes was my band director for years and taught me to read music and directed the school plays. I learned about mummies and Egyptian pyramids in Suzi Schumacher’s class. Mr. Valdez (Mr. V) had an awesome social science Jeopardy game we got to play on Fridays where I learned about Martin Luther King and the Civil Rights movement. Other fantastic teachers include Doris Lombard, Patti Carretallo, Mrs. Sazer-Krebers, Mr. Leigh, among others. And, of course, Holly Guntermann taught me how to play (softball, basketball, volleyball, dodge ball and tennis, just to name a few games). My mom was a big influence too — she was the Girl Scout leader and taught us girls all about camping and survival skills. Please share one of your favorite childhood Idyllwild memories. Halloween. I loved the parade and trick-or-treating in town. I loved the apple cider from the Candy Cupboard and the haunted maze at the Town Hall. The school play was one of my favorite childhood experiences. I loved everything about the plays — the costumes, the sets, the music and dancing. Such an extraordinary experience for kids. I also loved sunset at the point where all the kids would meet to hang out, and play hackey sac and guitar. I also loved summer camp at ISOMATA (before Idyllwild Arts). Get outside. Get some time offline and away from phones, social media and technology. Play games, climb rocks, read books, take advantage of the cool art and music programs at Idyllwild Arts. Learn the constellations on summer nights laying out with your friends under the stars. Dream of the coolest possible adventures you can think of and go do it (and I am talking riding camels through the pyramids in Giza, wading through swamps infested with crocodiles and piranha kinds of adventures). I did and it was as cool as I dreamed it would be. There is a fascinating, beautiful world out there. Go explore it. Idyllwild will be there, with open arms when you come home. College is not the only way to do it, but it opened up some pretty amazing opportunities for me. On that vein, college isn’t too expensive: I put myself through school and got grants and scholarships. I took out a few student loans, but it was worth every penny. Life is short. Have fun, dream big and be adventurous.